Are you ready to rock? Of course you are, or you wouldn’t be reading this. One person who is ready, willing and able is Steve Newman, the vocalist, guitarist and general head honcho of Newman. This is a man who knows the cardinal rule of rock music: if you name the band after yourself you can’t get fired. “Siren” is the ninth full album since 1998, and it’s been two years since the very well received “Under Southern Skies”, with no reason to suspect that the new disc won’t be afforded a similar reaction. As usual, Newman himself does the lions share of the work, partnered up with his usual drummer Rob McEwen. Tourring guitarist Shaun “Da Prawn” Bessaant and Robert Sall both get a track each to show off their own guitar skills, but this is the Newman show, make no mistake. As ever, it’s an incredibly solid offering, full of hard hitting melodic rock, more guitar than keyboards and full of Newman’s standard ‘take no prisoners’ attitude. His vocals are as good as ever, and the clean production (by Steve himself, natch) really allows the songs to stand out. The stall is set out with opener “Scar Of Love”, an immediately catchy track with a cool, angry guitar riff. Much like opener “Hero To Zero” from 2010’s “Balance” album, it doesn’t let up, although thankfully on this album there’s no annoying (and poinyless) intro, as we’re straight into the action with no twatting about. There’s a couple of slower tracks toward the end, and whilst “When It Comes To Love” is a great, powerful ballad, “The Foolish One” tends to drag a little. That said, it’s the only track of the twelve on offer that does, and it does have a great solo which helps. “Siren” will naturally delight existing Newman fans, and with any luck will win him some new ones. It’s up there with his best work, with this and the last two albums all coming over very strongly indeed as quality hard melodic rock. 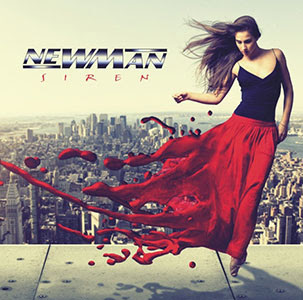 If you like melodic rock that has a little bite to it and doesn’t have songs about cruising down highways then Newman is pretty much a must have, as with “Siren” his winning streak continues unabated.